If you work in retail, chances are that the last few months have been an incredibly hectic time for you. Between making sure your store is prepared for Black Friday shoppers or Cyber Monday deals certainly requires a good bit of energy. And, of course, last minute shoppers were no doubt knocking down your door to get some last minute gifts for friends and family members. Other business owners have likely been busy as well. Even if you don’t own a retail store, things often get busy around the holidays because your clients are people who do own retail stores. The long and short of it is that the last couple of month’s are busy for everyone. The last of the major holidays is now over and we’re all doing our best to start the new year off on the right foot. For many of us, it’s the much needed (and much deserved) chance to take a breath and get caught back up and settle into a normal routine once more. That’s also what makes it the perfect time to call in a commercial electrician to make a few changes for your business. No matter what type of work you need done, you can count on us to handle it with a level of care and an attention to detail that is simply unmatched in our line of work. We pride ourselves on showing our customers our dedication to honesty and integrity every step of the way, so regardless of the task at hand, you can rely on us to get it done the right way the first time around. It’s as simple as that. We’ve been in business since 2006, but our dedication to our craft goes back far beyond that. As a matter of fact, one of our licensed electricians and project managers have an average over two decades of industry experience. What that means for you is that you’re getting someone who has pretty much seen and done it all. Each and every member of our crew is passionate about what we do and there’s nothing we love more than seeing a smile on your face after a job well done. As we mentioned above, we can help your business no matter what it is. Whether it’s a retail store, a local restaurant, a warehouse, a hospital, or anything in between, if there’s an electrical upgrade that needs to be done, we would be happy to help. You likely know that we are located in Jackson, TN, but we serve a wide variety of locations. As a matter of fact, we’re licensed to work in Arkansas, Alabama, Colorado, Florida, Georgia, Kentucky, Kansas, Louisiana, Mississippi, Missouri, North Carolina, Oklahoma, South Carolina, Tennessee, Texas, Virginia, and West Virginia. This allows us to provide our quality customer service and attention to detail across the country. 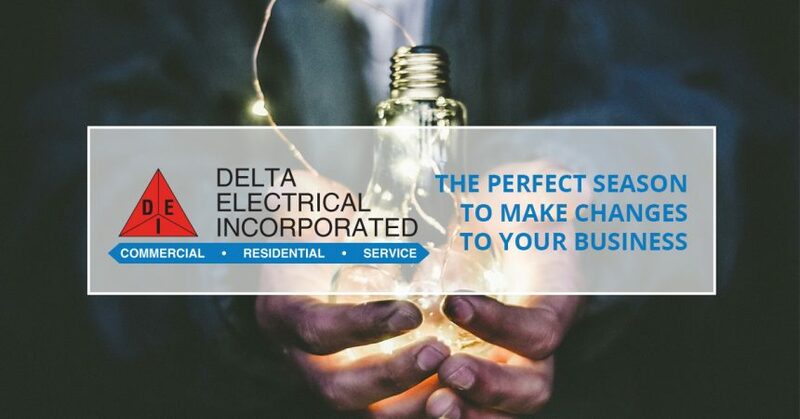 If you have a big job coming up, put your trust in the best of the best and get in touch with the team at Delta Electrical. Check out our about us page to get a feel for who we are as a company and then read a few of our reviews to see what our clients have to say about us. After all, there’s no better way to tell what you can expect from a company than by hearing what actual customers have to say! No matter what your job looks like, we’d love to help. Don’t hesitate to contact us today to get started. We look forward to making your business a better place in the new year!